Vijayaraj is a famous Tamil film actor (veteran of 147 films), and budding Politician. His screen name is Vijaykanth. He is also affectionately called as Captain by his fans and colleagues in Kollywood after his blockbuster film Captain Prabhakaran. He has the largest proven organised fanbase in Tamil Nadu among all heroes in Kollywood. He is the President of South Indian Film Artistes Association, also recently led a tour of South Indian artistes including matinee idols Kamal Haasan and Rajnikanth to Singapore and Malaysia and conducted star nites and the collection was used to wipe out the debts incurred by the Association. He is the recipient of Tamil Nadu Government's Kalaimamani Award, Indian Government's Best Citizen of India Award, Filmfare Award, Cinema Express Award et al. He successfully entered the Tamil Nadu Assembly in 2006 by starting his own party, the DMDK (Desiya Murpokku Dravida Kazhagam ) polling nearly three million votes. Most recent achievement: Won the 2006 election in his constituency, Virudhachalam where he was standing for his party, DMDK. Sons : Vijay Prabhakar, Vignesh Pandian. Mrs.Janaki Ramachandran had given him the van used by MGR during his political campaign. Donates Sewing Machines, Tricycle, Iron Box, Idli Vessels etc., to poor people on his birthday. Helps poor students with good marks to join colleges and accommodates them in his Engineering college without charging any fee from them. Donates Rs.25,000 to Little Flower School every year. Donates Rs.50,000 to MGR Blind School every year. Donated Rs.200,000 to Defence Personnel Children Education Fund every year. Donated Rs.500,000 to Kargil Relief Fund. In the assembly elections held on 10th May 2006, his party candidates contested in all 234 constituencies. His party, unlike major parties in Tamilnadu, did not have media support/coverage. In spite of that, his party gained nearly 10% of votes in the state of Tamilnadu. This achievement is significant for a budding party like DMDK which is now considered as potent competition to casteist and Dravidian parties like PMK AND MDMK respectively. Many of his recent movies contains nationalist plots about a terrorist, corrupt Indian politician or mafia don troubling the Indian people and Vijaykanth getting back at the trouble-makers single-handedly. He is also famous for acting village oriented movies, many of them had huge success across Tamil Nadu. My Name is H.Sameena, I am from Thiruvallur. I finished my Bsc(cs) now am doing MBA in correspondence i am from middle class family still i didnt get any job for the past two years am having one elder sister and two younger brother my sister also studying course in correspondence only.Please help me by providing any good job that must be very helpful for my family.Please help me uncle its my humble request for u.Please help me ,help me, help me soon uncle. Please Reply me soon uncle i am already so much dippressed Please help me Please! I like your approach on banging the criminal activities of the current useless government. i would like to know your e-mail ID, i'm an NRI Working in Brunei. i would like to send you some mails.of-course you may be aware of the mails i'm going to send. and i need all those things to be exposed via our captain TV. i am sivarajah kokulan from Jaffna (In srilanka). i am handicap. my decease name is charcot marie tooth. sir i want to take treatment in Kerala. I don't know any body or anywhere in india. please help me. sir,i m from madurai sir.i need ur help sir.pls help me.i want to share something sir..
i hope you,you will call me.thank u sir.. I am murugesan from karur.now i am doing MCA in AALIM MUHAMMED SALEGH COLLEGE OF ENGINEERING,CHENNAI. i am comin from very poor family. my father is a cooly worker and my mother also.i am doing mca by loan due to my family switchation.I NEED A LAPTOP FOR DOING MY PROJECT. so i kindly request you to give me a laptop.please consider this request. I like your bold argument against J.Jayalalitha before Sankarankovil election. In fact I didn't like when you joined with ADMK. Thanks for repenting soon. Stand alone & wait for your day. I am so depressed because of DMK, ADMK rule & so the people of Tamilnadu. I would like to have your email id. i am sindhu . Studying m.b.a final year. Due to my family backgroud i can not continue my study . I am a clasas first mark student sir at O.A.S institute of technology. Trichy. Please help me. My email id rajsnd1991@gmail.com. Obtain Adventureland Total Movie - Designed for Free Officially? Obtain Pink Panther two Movie Absolutely free - Certainly? Everyone in Tamilnadu looking for your perfect decision regarding alliance for the coming Loksabha 2014 election because you are very younger and can take a decision like AK in Delhi. I would like to suggest that please alliance with BJP to use your power in centre with honourable manner and also to get so many scheme for TN. All the Best for your life and party forever. Pls have aliance with BJP in the LS 2014 in the best interest of the nation. Throw the DMK and Congress out of power. Just due to PMK or any other DMK offer pls dont join hands with the DMK mafia. If you choose to face the elections alone or with wrong aliance (DMK) ADMK will sweep. United the NDA aliance will sweep in TN. Looking you forward to join hands with BJP and sweep the elections. sir,few month back i saw raj tv, koppiyam program about coimbatore district, Karumathampatti chruch land. and About karumathampatti panchayat president A.C.Magalingam.wt raj tv told is wrong information.As Acm is Admk and roling party, raj tv put wrong information. Actually,land of chruch occupied few peoples for past 40-50 years or more.they not paying rent (kuthayai) to chruch and also not leaving land.it is headache to chruch management.so they decided to sell land and use that money for school and college buliding etc. with higher permisision. they sold land to Somu promoters. somu promoter apply for site approval for that land.panchayat president A.C.magalingam Ask 4 cores for approval.somu promotar didnt accept to pay that amount.so Acm publish news in news paper that, not to buy Unapproved land of Somu promoter. then somu promoter accept to give cash to Acm, and give 1cores. and take video and filled case against Acm in vigilense. now Acm got bail in court. this is the true happen. but raj tv said wrong information in Koppiyam program. And Actally, A.c.m asking more amount for buliding Approval.Bcoz of that real estate married in karumathapatti in nil. Only friends of A.C.M can do real estate with percentage to A.C.M. Non other can do business. Sir. Please keep alliance with DMK. It is good for our party growth in future. I am really belonging Ur party. Don't get wrong decision. ANni u help him . Recently all other opposite party TV channels are telecasting only your day by day activities including anger with MLAS and previous years file videos for damage your name.People whose those are watching this telecast, they dont know the actual reason for that.So the opposite parties only the target is to damage your name by doing like this.So please dont allow that this time.Our captain always go to peak position only.This is our all wishes also. My name is Rani and i am in need of a job. I have always dreamed of being a news-reader. Will you make my dream come true. I do not have any phone numbers and am not sure how to speak to you. If you could please give me a phone number or an appointment, I wish to meet you in person and submit my resume. U may send me a mail in this regard at gr8dayzahead@gmail.com I do not wish to reveal my phone number here as it is a public forum. Thank u for your understanding. I trust you will help me if you could. 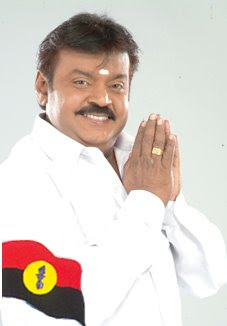 Mr. Vijayakanth If you want to win the upcoming election call me. Only one simple thing you have to do that's it. This is my thought. In this election, DMDK Will get 35% of votes. So that, why you need to join another useless parties. Better try not to join anyother parties and face the election alone. Dear Vijaykanth Sir, I am a muslim woman and a lawyer. I am one of those who voted for you when you first contested polls. In fact, on reaching the polling booth, I realised that I had forgotten my voter ID. So, I went back home and returned with my voter ID to cast my vote for your party. What drew me then was your vision to provide toilets for all homes (long before the present swachh bharat campaign). Even now I'm impressed by your focus on the essentials and basics of public aspiration. What, however, worries me is that in less evolved democracy like ours, sons of political leaders invariably go around like Yuvarajas, as witnessed in Congress, Tamilnadu, Haryana, UP, Bihar and elsewhere. So, it is my concern that you too should not fall to the idiom 'blood is thicker than water'. In fact Modiji scores as a PM on this point alone, as he is free from nepotism. I do hope that you'll view the whole of Tamilnadu, which has embraced you wholeheartedly and graced you with name and fame, as your children and refrain from family politics, which has ruined our nation. We are very much happy about your decision to face the upcoming election without joining with DMK and ADMK. We are having full confident on you to run Tamilnadu government better than all. We are requesting you for promising to execute the State Water Way Project proposed and designed by Mr.A.C.Kamaraj which is the dream of our Abdul Kalam. It is easily possible one and can be made possible really by you. We are believing you can do it. If you added this with your election promises surely Tamilnadu people will appreciate and select you. If you required any support regarding this please send your whatsapp mobile no.to me. We will prepare and send to you, a powerful prsentation which can reach each and every person in Tamilnadu. Kindly add this request in your Therthal vaakuruthi list. Please close all paan items(Haans,pan parak,etc). Because of this many people causing mouth cancer. Eventhough it is banned, many shop sellers are selling it. Its my kind request. please close this paan selling. All family members secret to get vote from them. Please contact me. 9994396798. Hi reader, please intimate this msg to both as soon as possible. Captain vijayakanth 2016 Nam vetri peruvathu nichaiyam. Nam nagercoil thoguthil vetri nichaiyam.... Nan oru satharana kudimagan.tamil valga, captain valga........ Adutha cm captain dhan. Nagercoil thoguthil vetri perum Katchi dhan thalamayil aatchi amaikum. Nan ithuvaraikum vote potadhu dmk.ini vote poduvathu captainku.please give cell number sir.Nan Katchiyil illamal satharana captainin thondan....... Vilambaram illamal nanmai seiyum ore Manithan captain dhan. My name is geetha from buvanagiri taluk.my home was fired on 30/03/16.now i am homeless & helpless.I'm in poor family.I studied MA.B.Ed english.no job for me.u only real human being in people's heart.that's my strong hope.bright future for u.plz do any help my family.my hope only for u. old parents,vidow sister,jobless M.SC.IT studied brother,this is my poor family.I except any job or any help to our family sir. My contact no 9698004522. Is any one have captain's best citizen award photo? Or any other information related to Best citizen award. sure he will become a CM one day and that is not far.We are waiting. Hi vijayakanth uncle, am Sandhya 21 years old. I like your attitude. Ungaludaiya past records paakum pothu nijama awesome. By hearing and saw you received best citizen award. I feel happy. Ungaludaiya ellam movies enaku romba pidikum . nan chinna vayasula paathu irunthalum inumum nybagam iruku.. Reala irukum acting. Ungaludaiya helping sense , nan thalai vananuguren, hats off you uncle. Enaku oru help panuveengala? Panuveenganu ethir paakuren . sir ..I am from poor family. I want to play badminton. Plz help to play and give me a free training ..I want to play badminton beat the best ..Plz sir 8220588002 is my number . I need a best training ..in my childhood am not able to go for coaching classes .because am doesn't have enough money.. Plz sir help me ..my name is Jegadeesh Kumar .am from Rajapalayam. Sir naan ongala oruvaattiyaachi paakkanum ongaloda oru photo eduthukkanum..
Madame this question is towards you.ur eldest son was interested in buying a great Dane puppy from my son.. The deal was called off coz u wanted the mother (Fiona,)sorry Madame we just can't be without her but u can take her babies,that's if you wish.My phone number is 95 97 309 389.pinto is my name.May God give long life to ur husband. I LOST MY BUSINESS 2016. In the world And(SORRY)don't want any help. Only right person my Tamil nadu CHIEF MINISTER. I'm interested in join This team. ALL THE VERY BEST MR.VIJAYAKANTH SIR. I'M WAITING FOR THAT HAPPY MOVEMENT. enakku veara yaraun theriyathu captain sir so i kindly request.please help to me sir. I am Panchapagesan from Trichy. I am not a follower of any political party but I wish to state here my opinion which may be helpful to you in your decision regarding 2019 elections. Your party has a goodwill worth of 52% in the Political Market and kindly utilise this opportunity to get into the power. MY MAIN POINT TO MENTION HERE IS THAT PLEASE CONTEST IN ALL THE 40 CONSTITUENCIES "INDEPENDENTLY". Please ask your in law Mr.Sathish to go for Canvasing and "PLEASE DO NOT SEND YOUR SONS FOR THIS PART AT PRESENT AS THEY ARE YET TO GET MATURED FOR IT". Please be just present in your van and show your face to voters. YOU WILL WIN THIS TIME WITH GOOD NUMBER OF VOTES. PLEASE CONTEST ALONE IN ALL THE 40 CONSTITUENCIES. You have your individual leadership capacity. Please reward your party members by contesting alone. Teams formed to arrest Vijayakanth!!!!! Last TamilNadu Election Results For Your View!! !